Calm your emotions with Aromatherapy Associates Inner Strength Bath & Shower Oil. Ideal for people who are in need of positivity, the uplifting fragrance of clary sage, frankincense and cardamom will give you strength and courage. Created by Aromatherapy Associates' Co-Founder and President, Geraldine Howard, when she was receiving treatment for cancer, the soothing scent balances your emotions and focuses the mind, as well as restoring physical strength when you feel drained. 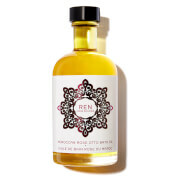 The nourishing oil stimulates your circulation to leave you feeling emotionally and physically healthier. 10% of all proceeds of this bath and shower oil go to the Defence Against Cancer Foundation. Add a capful to your bath or smooth it all over your body before showering. Follow with an appropriate body wash and moisturiser. There is enough oil for approximately 20 experiences.